An early build of Windows 7's first service pack has been leaked, leading to thousands of downloads on a whole host of various torrent Web sites. As with every Windows operating system (OS) release, improvements and fixes often arrive in the form of a service pack, and only last month the Windows team discussed the upcoming Windows 7 SP1 release in a blog post. The team detailed that the first service pack would feature a number of minor updates for the popular OS. 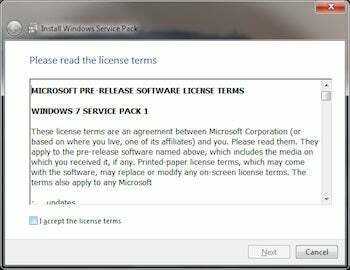 However, it is worth noting that the Windows team did not mention a final release date for the completed service pack . Microsoft has not officially announced when the final first service pack will be available. If you have tried the 'unofficial' beta be sure to let us know in the comments. More images of the installation process can be found on Geek Smack.